You can contact the NYC Feral Cat Initiative at info@NYCFeralCat.org or (212) 330-0033 x5 and we will attempt to find someone to bottle-feed the kittens, but this might take days or weeks, and we might not be successful in locating a feeder. 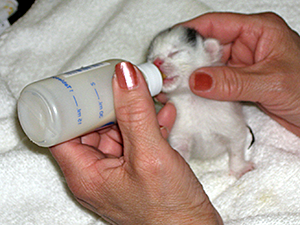 If we do find someone to bottle-feed, you might still be responsible for taking the kittens back when they no longer require bottle-feeding. You also might be responsible for paying for veterinary visits, which might include emergency medical care, and will definitely include spay or neuter surgery, disease testing, and vaccinations. And finally, you might be responsible for adopting the kittens into permanent homes. 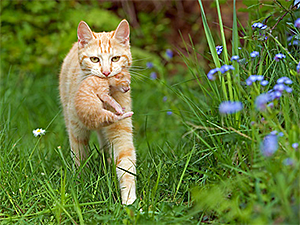 The NYC Feral Cat Initiative can help you locate low-cost veterinary care, and might be able to help you find new homes for the kittens, but completing these tasks will be your responsibility. 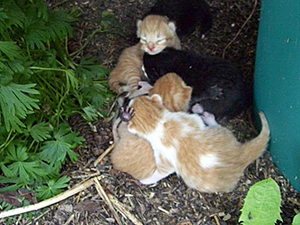 Determine the age of the kittens by comparing them to the photos and descriptions on the How Old Is That Kitten? Kitten Progression: At-a-Glance page on the Alley Cat Allies website, or the Boutique Kittens website (Note: we do not advocate breeding or buying kittens; these kitten development photos just happen to be particularly descriptive.). Powdered kitten milk replacement formula is better for kittens than the canned liquid formula. We recommend that you use only powdered kitten milk replacement formula from the start — or as soon as possible — to prevent diarrhea. Two major brands of formula are available: PetAg KMR® Powder and Farnam Pet Products Just Born® Highly Digestible Milk Replacer for Kittens. Both brands are available in both canned and powdered formulas. We highly recommend the powdered type to prevent diarrhea. It can be purchased at pet food stores, veterinarians’ offices, or online. Revival Animal Health offers the lowest prices we know of. Call us at (212) 330-0033 x5 and leave a voicemail with your name, address, and a description of what instructions/information you need.